Pink gives optimism and color in a world of fuzzy grays. Likely to be chosen by Edith Piaf, la vie en rose is only as far away as your soles. From the first wash to the next 20, these pink socks will tickle your toes. 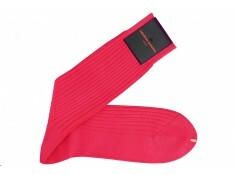 Pink socks are original and dynamic in 100% fil d’Ecosse. A perfect match to an elegant pink shirt.